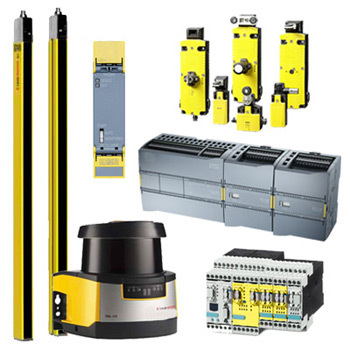 Certain risks and dangers are an inherent part of industrial automation; however, machine guarding and related devices or methods provide simple and effective ways to ensure safety. National or international safety standards such as the ANSI/RIA R15.06, ISO 10218, and CSA Z434 should always be adhered to. These standards specify proper methods and procedures for keeping your personnel safe. Safety fencing or guarding is a physical barrier that keeps humans out of a specific area containing equipment and is a general precautionary measure. Safety interlock switches monitor the position of a guard or gate. You can use them to shut off power, control personnel access and prevent a machine from starting when the guard is open. Often used in conjunction with guarding, safety light curtains are opto-electronic devices that work with a transmitted array of infrared light beams and a receiver of photoelectric cells. A connected safety relay sends a stop signal to equipment when one or more beams are broken. Safety sensors that detect the presence of operators near hazardous machines can be used to help protect people from injury. These include safety laser scanners which scan their surroundings and measure distances by using time-of-flight measurement. An integrated rotating mirror creates a two-dimensional scan for freely defined protection areas. Single- or multi-beam photoelectric sensors can be used to detect intrusions in hazardous areas. Muting sensors used with a muting controller can distinguish between a workpiece and a human by the timing of the detection between two sensors.